Corticosteroids are a class of steroid hormones that are produced in the adrenal cortex of vertebrates, as well as the synthetic analogues of these hormones. Two main classes of corticosteroids, glucocorticoids and mineralocorticoids, are involved in a wide range of physiologic processes, including stress response, immune response, and regulation of inflammation, carbohydrate metabolism, protein catabolism, blood electrolyte levels, and behavior. Glucocorticoids such as cortisol affect carbohydrate, fat, and protein metabolism, and and have anti-inflammatory, immunosuppressive, anti-proliferative, and vasoconstrictive effects. Anti-inflammatory effects are mediated by blocking the action of inflammatory mediators (transrepression) and inducing anti-inflammatory mediators (transactivation). Immunosuppressive effects are mediated by suppressing delayed hypersensitivity reactions by direct action on T-lymphocytes. Anti-proliferative effects are mediated by inhibition of DNA synthesis and epidermal cell turnover. Vasoconstrictive effects are mediated by inhibiting the action vasoconstrictive mediators such as histidine. Typical undesired effects of glucocorticoids present quite uniformly as drug-induced Cushing's syndrome. Typical mineralocorticoid side-effects are hypertension (abnormally high blood pressure), hypokalemia (low potassium levels in the blood), hypernatremia (high sodium levels in the blood) without causing peripheral edema, metabolic alkalosis and connective tissue weakness. There may also be impaired wound healing or ulcer formation because of the immunosuppressive effects. There is some basis for genetic variation in patients' response to inhaled corticosteroids. Two genes of interest are CHRH1 (corticotropin-releasing hormone receptor 1) and TBX21 (transcription factor T-bet). Both genes display some degree of polymorphic variation in humans, which may explain how some patients respond better to inhaled corticosteroid therapy than others. Neuropsychiatric: steroid psychosis, and anxiety, depression. Therapeutic doses may cause a feeling of artificial well-being ("steroid euphoria"). The neuropsychiatric effects are partly mediated by sensitization of the body to the actions of adrenaline. Therapeutically, the bulk of corticosteroid dose is given in the morning to mimic the body's diurnal rhythm; if given at night, the feeling of being energized will interfere with sleep. An extensive review is provided by Flores and Gumina. Gastro-intestinal: While cases of colitis have been reported, corticosteroids are therapeutically employed when the colitis has an auto-immune nature, e.g. ulcerative colitis and Crohn's disease. While the evidence for corticosteroids causing peptic ulceration is relatively poor except for high doses taken for over a month, the majority of doctors as of 2010 still believe this is the case, and would consider protective prophylactic measures. Habituation: Topical steroid addiction (TSA) has been reported in long-term users of topical steroids (users who applied topical steroids to their skin over a period of weeks, months, or years). TSA is characterised by uncontrollable, spreading dermatitis and worsening skin inflammation which requires a stronger topical steroid to get the same result as the first prescription. When topical steroid medication is lost, the skin experiences redness, burning, itching, hot skin, swelling, and/or oozing for a length of time. This is also called 'red skin syndrome' or 'topical steroid withdrawal'(TSW). After the withdrawal period is over the atopic dermatitis can cease or is less severe than it was before. In general, corticosteroids are grouped into four classes, based on chemical structure. Allergic reactions to one member of a class typically indicate an intolerance of all members of the class. This is known as the "Coopman classification", after S. Coopman, who defined this classification in 1989. Hydrocortisone, hydrocortisone acetate, cortisone acetate, tixocortol pivalate, prednisolone, methylprednisolone, and prednisone (Short- to medium-acting glucocorticoids). Triamcinolone acetonide, triamcinolone alcohol, mometasone, amcinonide, budesonide, desonide, fluocinonide, fluocinolone acetonide, and halcinonide. Hydrocortisone-17-valerate, halometasone, alclometasone dipropionate, betamethasone valerate, betamethasone dipropionate, prednicarbate, clobetasone-17-butyrate, clobetasol-17-propionate, fluocortolone caproate, fluocortolone pivalate, and fluprednidene acetate. Hydrocortisone-17-butyrate, hydrocortisone-17-aceponate, hydrocortisone-17-buteprate, ciclesonide and prednicarbate. Topical corticosteroids are divided in potency classes I to IV in most countries (A to D in Japan). There are seven categories used in the United States. There is also a combination preparation containing fluticasone propionate and salmeterol xinafoate (a long-acting bronchodilator). It is approved for children over 12 years old. Such as prednisone and prednisolone. First known use was in 1944. Tadeusz Reichstein together with Edward Calvin Kendall and Philip Showalter Hench were awarded the Nobel Prize for Physiology and Medicine in 1950 for their work on hormones of the adrenal cortex, which culminated in the isolation of cortisone. Initially hailed as a miracle cure and liberally prescribed during the 1950s, steroid treatment brought about adverse events of such a magnitude that the next major category of anti-inflammatory drugs, the NSAID, was so named in order to demarcate from the opprobrium. Corticosteroids have been used as drug treatment for some time. Lewis Sarett of Merck & Co. was the first to synthesize cortisone, using a complicated 36-step process that started with deoxycholic acid, which was extracted from ox bile. The low efficiency of converting deoxycholic acid into cortisone led to a cost of US $200 per gram. Russell Marker, at Syntex, discovered a much cheaper and more convenient starting material, diosgenin from wild Mexican yams. 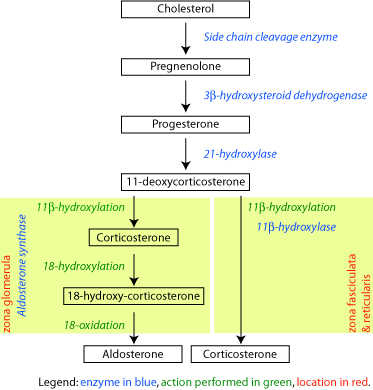 His conversion of diosgenin into progesterone by a four-step process now known as Marker degradation was an important step in mass production of all steroidal hormones, including cortisone and chemicals used in hormonal contraception. In 1952, D.H. Peterson and H.C. Murray of Upjohn developed a process that used Rhizopus mold to oxidize progesterone into a compound that was readily converted to cortisone. The ability to cheaply synthesize large quantities of cortisone from the diosgenin in yams resulted in a rapid drop in price to US $6 per gram, falling to $0.46 per gram by 1980. Percy Julian's research also aided progress in the field. The exact nature of cortisone's anti-inflammatory action remained a mystery for years after, however, until the leukocyte adhesion cascade and the role of phospholipase A2 in the production of prostaglandins and leukotrienes was fully understood in the early 1980s. Corticosteroids were voted Allergen of the Year in 2005 by the American Contact Dermatitis Society. The cortico- part of the name refers to the adrenal cortex, which makes these steroid hormones. Thus a corticosteroid is a "cortex steroid". 1 2 Nussey, S.; Whitehead, S. (2001). Endocrinology: An Integrated Approach. Oxford: BIOS Scientific Publishers. ↑ Nussey, Stephen; Whitehead, Saffron (2001-01-01). The adrenal gland. BIOS Scientific Publishers. 1 2 3 4 5 6 7 Liu, Dora; Ahmet, Alexandra; Ward, Leanne; Krishnamoorthy, Preetha; Mandelcorn, Efrem D; Leigh, Richard; Brown, Jacques P; Cohen, Albert; Kim, Harold (2013-08-15). "A practical guide to the monitoring and management of the complications of systemic corticosteroid therapy". Allergy, Asthma, and Clinical Immunology : Official Journal of the Canadian Society of Allergy and Clinical Immunology. 9 (1): 30. doi:10.1186/1710-1492-9-30. ISSN 1710-1484. PMC 3765115 . PMID 23947590. ↑ Werner R (2005). A massage therapist's guide to Pathology (3rd ed.). Pennsylvania: Lippincott Williams & Wilkins. ↑ Carvalho-Recchia, CA; Yannuzzi, LA; Negrão, S; Spaide, RF; Freund, KB; Rodriguez-Coleman, H; Lenharo, M; Iida, T (2002). "Corticosteroids and central serous chorioretinopathy". Ophthalmology. 109 (10): 1834–7. doi:10.1016/S0161-6420(02)01117-X. PMID 12359603. ↑ "The New York Times :: A Breathing Technique Offers Help for People With Asthma". buteykola.com. Retrieved 2012-11-30. ↑ Alderson P, Roberts I. "Plain Language Summary". Corticosteroids for acute traumatic brain injury. The Cochrane Collaboration. p. 2. ↑ Alderson, P.; Roberts, I. (2005). Alderson, Phil, ed. "Corticosteroids for acute traumatic brain injury". Cochrane Database Syst Rev (1): CD000196. doi:10.1002/14651858.CD000196.pub2. PMID 15674869. ↑ Tantisira KG, Lake S, Silverman ES, Palmer LJ, Lazarus R, Silverman EK, Liggett SB, Gelfand EW, Rosenwasser LJ, Richter B, Israel E, Wechsler M, Gabriel S, Altshuler D, Lander E, Drazen J, Weiss ST (2004). "Corticosteroid pharmacogenetics: association of sequence variants in CRHR1 with improved lung function in asthmatics treated with inhaled corticosteroids". Human Molecular Genetics. 13 (13): 1353–9. doi:10.1093/hmg/ddh149. PMID 15128701. ↑ Tantisira KG, Hwang ES, Raby BA, Silverman ES, Lake SL, Richter BG, Peng SL, Drazen JM, Glimcher LH, Weiss ST (Dec 2004). "TBX21: A functional variant predicts improvement in asthma with the use of inhaled corticosteroids". PNAS. 101 (52): 18099–18104. doi:10.1073/pnas.0408532102. PMID 539815. ↑ Hall, Richard. "Psychiatric Adverse Drug Reactions: Steroid Psychosis". Director of Research Monarch Health Corporation Marblehead, Massachusetts. ↑ Korte SM (2001). "Corticosteroids in relation to fear, anxiety and psychopathology". Neurosci Biobehav Rev. 25 (2): 117–42. doi:10.1016/S0149-7634(01)00002-1. PMID 11323078. ↑ Swinburn CR, Wakefield JM, Newman SP, Jones PW (December 1988). "Evidence of prednisolone induced mood change ('steroid euphoria') in patients with chronic obstructive airways disease". Br J Clin Pharmacol. 26 (6): 709–713. doi:10.1111/j.1365-2125.1988.tb05309.x. PMC 1386585 . PMID 3242575. ↑ Hasselgren PO, Alamdari N, Aversa Z, Gonnella P, Smith IJ, Tizio S (July 2010). "CORTICOSTEROIDS AND MUSCLE WASTING ROLE OF TRANSCRIPTION FACTORS, NUCLEAR COFACTORS, AND HYPERACETYLATION". Curr Opin Clin Nutr Metab Care. 13 (4): 423–428. doi:10.1097/MCO.0b013e32833a5107. PMC 2911625 . PMID 20473154. ↑ Donihi AC, Raval D, Saul M, Korytkowski MT, DeVita MA (2006). "Prevalence and predictors of corticosteroid-related hyperglycemia in hospitalized patients". Endocr Pract. 12 (4): 358–62. doi:10.4158/ep.12.4.358. PMID 16901792. ↑ Blackburn D, Hux J, Mamdani M (2007). "Quantification of the risk of corticosteroid-induced diabetes mellitus among the elderly". Journal of General Internal Medicine. 17 (9): 1525–1497. doi:10.1046/j.1525-1497.2002.10649.x. ↑ Zhang, L; Prietsch, SO; Ducharme, FM (Jul 17, 2014). "Inhaled corticosteroids in children with persistent asthma: effects on growth.". The Cochrane database of systematic reviews. 7: CD009471. doi:10.1002/14651858.CD009471.pub2. PMID 25030198. ↑ Pecora PG, Kaplan B (1996). "Corticosteroids and ulcers: is there an association?". Ann Pharmacother. 30 (7–8): 870–2. doi:10.1177/106002809603000729. PMID 8826575. ↑ Martínek J, Hlavova K, Zavada F, et al. (June 2010). ""A surviving myth" —corticosteroids are still considered ulcerogenic by a majority of physicians". Scand J Gastroenterol. 45 (10): 1156–61. doi:10.3109/00365521.2010.497935. PMID 20569095. ↑ Fukushima, C.; Matsuse, H.; Tomari, S.; Obase, Y.; Miyazaki, Y.; Shimoda, T.; Kohno, S. (2003). "Oral candidiasis associated with inhaled corticosteroid use: Comparison of fluticasone and beclomethasone". Annals of Allergy, Asthma & Immunology. 90 (6): 646–651. doi:10.1016/S1081-1206(10)61870-4. PMID 12839324. ↑ Shepard, TH. ; Brent, RL. ; Friedman, JM. ; Jones, KL. ; Miller, RK. ; Moore, CA. ; Polifka, JE. (April 2002). "Update on new developments in the study of human teratogens". Teratology. 65 (4): 153–61. doi:10.1002/tera.10032. PMID 11948561. ↑ Nnoruka, Edith; Daramola, Olaniyi; Ike, Samuel (2007). "Misuse and abuse of topical steroids: implications.". Expert Review of Dermatology. 2 (1): 31–40. doi:10.1586/17469872.2.1.31. Retrieved 2014-12-18. ↑ Sanjay, Rathi; D'Souza, Paschal (2012). "Rational and ethical use of topical corticosteroids based on safety and efficacy.". Indian Journal of Dermatology. 57 (4): 251–259. doi:10.4103/0019-5154.97655. ↑ Fukaya, M; Sato, K; Sato, M; Kimata, H; Fujisawa, S; Dozono, H; Yoshizawa, J; Minaguchi, S (2014). "Topical steroid addiction in atopic dermatitis.". Drug, healthcare and patient safety. 6: 131–8. doi:10.2147/dhps.s69201. PMID 25378953. ↑ Aljebab, F; Choonara, I; Conroy, S (April 2016). "Systematic review of the toxicity of short-course oral corticosteroids in children.". Archives of Disease in Childhood. 101 (4): 365–70. doi:10.1136/archdischild-2015-309522. PMC 4819633 . PMID 26768830. ↑ Rietschel, Robert L. (2007). Fisher's Contact Dermatitis, 6/e. Hamilton, Ont: BC Decker Inc. p. 256. ISBN 1-55009-378-9. ↑ Coopman S, Degreef H, Dooms-Goossens A (July 1989). "Identification of cross-reaction patterns in allergic contact dermatitis from topical corticosteroids". Br. J. Dermatol. 121 (1): 27–34. doi:10.1111/j.1365-2133.1989.tb01396.x. PMID 2757954. ↑ Wolverton, SE (2001). Comprehensive Dermatologic Drug Therapy. WB Saunders. p. 562. ↑ "Asthma Steroids: Inhaled Steroids, Side Effects, Benefits, and More". Webmd.com. Retrieved 2012-11-30. 1 2 3 4 5 6 Frieden, Thomas R. (March 2004). "Inhaled Corticosteroids — Long-Term Control Asthma medicine" (PDF). New York City Asthma Initiative. 1 2 "Systemic steroids (corticosteroids). DermNet NZ". . DermNet NZ. 2012-05-19. Retrieved 2012-11-30. ↑ Webster. "First therapeutic use of Corticosteroid". Retrieved 30 July 2012. ↑ Buer JK (Oct 2014). "Origins and impact of the term 'NSAID'". Inflammopharmacology. 22 (5): 263–7. doi:10.1007/s10787-014-0211-2. PMID 25064056. ↑ Marker, Russell E.; Wagner, R. B.; Ulshafer, Paul R.; Wittbecker, Emerson L.; Goldsmith, Dale P. J.; Ruof, Clarence H. (1947). "Steroidal Sapogenins". J. Am. Chem. Soc. 69 (9): 2167–2230. doi:10.1021/ja01201a032. PMID 20262743. ↑ Peterson DH, Murray HC (1952). "Microbiological Oxygenation of Steroids at Carbon 11". J. Am. Chem. Soc. 74 (7): 1871–2. doi:10.1021/ja01127a531. ↑ "Contact Allergen of the Year: Corticosteroids: Introduction". Medscape.com. 2005-06-13. Retrieved 2012-11-30.